Published on August 13, 2011. Takes about 7 minutes to read. 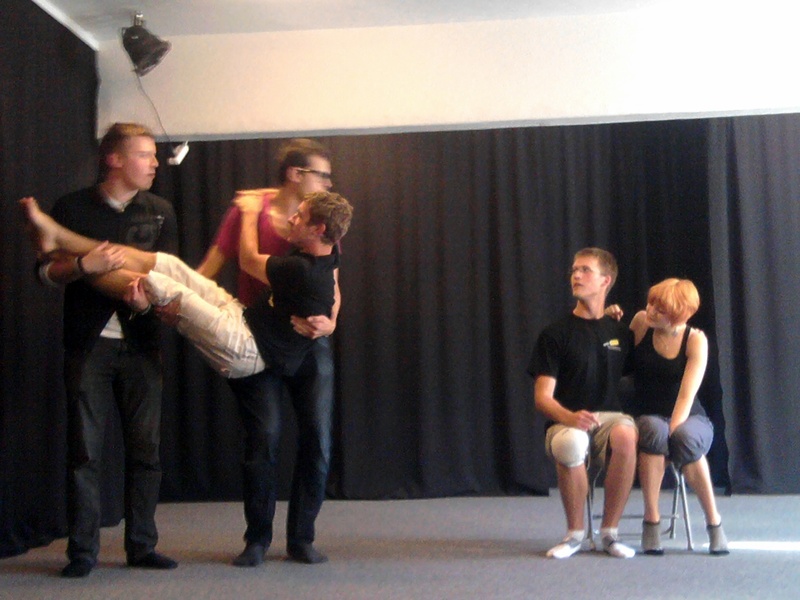 It's finally happening, the long-awaited improv workshop we (Improgrupp Jaa!) set up. The workshops take place over the period of three days, from Friday to Sunday and contain an evening show on Saturday and a public workshop on Sunday. The first day was epic. It's really something to have a professional teacher. There were 12 of us present, plus one Trentasaurus. We started out with the basic stuff, a couple of warm-up games like passing a clap in synchronization. Don't think it childish or silly, in truth we all need to let go of the "Ha-ha, I'm a grown-up and above it all" attitude and what a better way to shake it of than improv spontaneity? We did some (okay, a lot) of work on character building. Mr. Trent demonstrated different techniques to get inspiration and create personas on the fly. For me personally, it was one of the most difficult things I've done in theater so far. Considering I'm a guy with basically no experience in the field until improv, it wasn't so easy to create a new way to move, a voice, an attitude and a back-story, all in the course of a minute… and then jump into a scene and play it out. Some of the techniques - like drawing inspiration from an animal - really helped though and I bet they come in handy in the future. A character basically has one of two statuses: high or low. An exercise called the Goalie was great in that we had the opportunity to really see how statuses work together in creating a scene. These were the highlights of the first 5 hours. And I just have to say that someone who can make me do something I've sworn never to do - rap (and do an Elvis impersonation) - is just plain cool. …started at eleven o'clock with a couple of relaxation and stretching exercises. Among them was an exercise called Tactical Breathing, something I did in a martial arts course and is designed to help keep one's calm. The "Aha, I've done this before (and in a completely different field)" moment was nice. Trent explained to us the concept of keeping a "soft focus", being aware of everything happening (or about to happen) around you, but doing your own thing at the same time. Such awareness is really important when it's not just you on the stage; you have to be prepared to respond to your partner(s) at any given time. One of the many things I'm notoriously bad at is short-term memory. The instructor had us create random sequential patterns and then play them back several at the time. Intensive, but beneficial. A good chunk of the day went into practicing long form. 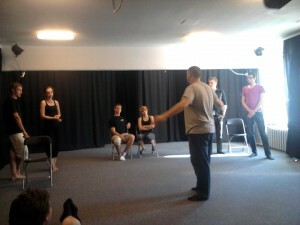 Teams of 5-7 took turns and performed a 20 minute play completely of the top of their heads, incorporating improv techniques and lessons learned the day before. Trent played the role of the director, giving tips on how to improve the scenes, pointed out plausible sidelines and brought attention to the actions and lines to avoid. We finished with the workshop half an hour before the evening show (7.30pm), set the stage in order and gave an hour long performance shortly after that. It wasn't a full house since we messed with the date the last minute, but the audience was still good. The new games got good laughs and the improved long form turned out quite well. The show debuted two new amateur actors (yeah, me) and while it didn't go horribly horribly wrong, I still wanted to shoot myself later - there's just so much to learn! Trent had been making notes the whole time and gave us loads and loads of useful pointers, tips and suggestions after the show. The best teachers are the ones who don't yell or say "Ha-ha, you failed" but rather explain why and where something went bad and how to fix it. 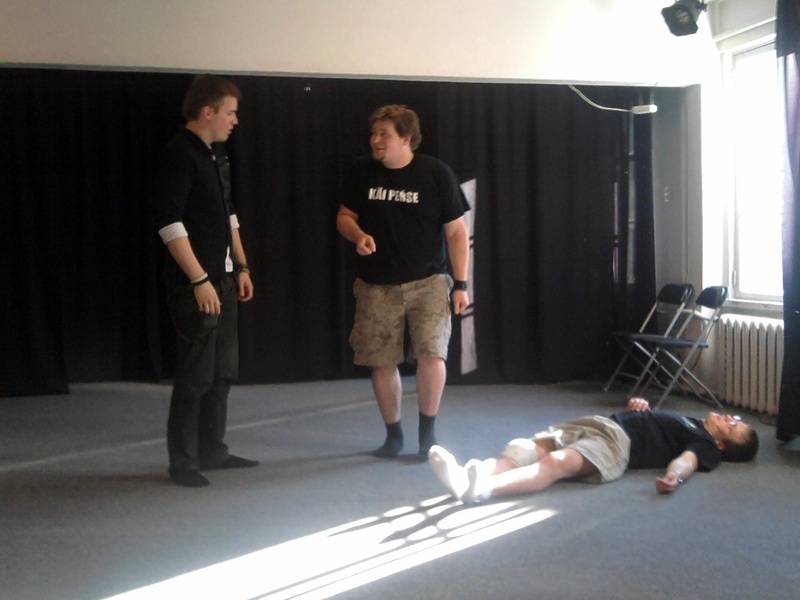 Eleven hours of improv is a lot. Time to crash and wake up early. Tomorrow is time for the public workshop. Ahh… the final day of an awesome weekend. The public workshop took place in a hall set up for dancers so there were a lot of mirrors on the walls… and also the weird ballet foot stretching handholds. In total, there was Trent, seven Jaa! members and fifteen-ish young (and some not so young) guests. Trent handled the task of creating a safe atmosphere really well and by the time the warm up games morphed into "You are The Master"… no complications. We did a number of mind-freeing and creativity-building exercises like creating a snapshot of a picture using only our bodies as well as playing the classic "Yes, and…". There were some trip-ups (which is natural) and it was good to see the members of the troupe (who were, by that time, already been drilled by Trent for 20+X hours) notice the pitfalls (and avoid some of their own), but overall I expected there to be more so that's only praise to the participants. Jaa!-s (hey, that's a cool name, we should keep that) were asked to help out a couple of times and maybe I'm being petty, but it was nice to feel like the guy who knew what was going on. Whenever we felt like there was too much tension and no beginner wanted to go to stage, we volunteered so as to break the ice and make everyone brave again. We did some character work, making faces at the mirror, adapting body movements and voices and then went on to work on more scenic based games. Some of the young improvisers were really good and brave, jumping in and doing a fantastic job. In another game, The Shopkeeper, one person actually managed to convince the shopkeeper to take back a dream catcher under… 30 seconds (?) without giving out any obvious clues. All in all, it felt like everyone who came out got a sense of what improv is, learned some basic principles, had a blast and maybe, just maybe, let improv change themselves just a bit. Maybe the best moment of the day was at the very end, when the pull of the grand piano sitting in the corner of the hall became too strong, I played a few chords and what was left of the group gathered around when Trent offered to do a short lesson on musical improv. Most of the guest had already left, but the remaining two sang along. Trent gave out brief instructions, I got my usual chord progression under the fingertips and before I could blink (figuratively speaking), a spontaneous musical about mirrors and one's true self ("Is it really me?") came to life, with Trent doing the verses beautifully and everyone acting and joining in for the chorus. I didn't pay much attention to what was going on, too scared to lose my primitive sequence and ruin the magic of the moment, but it was Brilliant. We kicked Trent back on a boat to Helsinki an hour later. 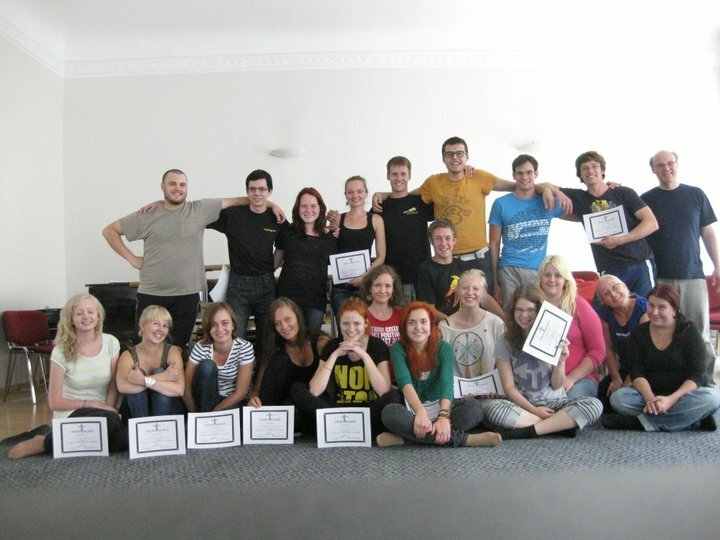 Four days of non-stop improv… it was amazing. All of us got some much needed tips and pointers on how to become a better improviser, did a live show and wrapped it up real nice with the public workshop. Despite the fact that the next day is Monday and work and deadlines come back (oh, and I caught a cold on the last night), it was worth it. All of this would have been impossible without our spiritual leader slash mother hen who took a big chunk of the logistical side and quite possibly crashed ASAP. Thank you, Trent Pancy. You were amazing. …and you know what? So was Jaa! Disclaimer: The following is a reflection of a personal opinion and is in no way officially tied to Improgrupp Jaa! or Trent Pancy. The photographs are posted with the permissions of those in the frame.